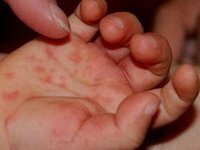 Some 2,524 people fell ill with measles in the 9th week of 2019, they include 1,230 adults and 1,312 children, according to the Center for Public Health under the Health Ministry of Ukraine, the ministry's press service said. A 25-day-old baby died from measles in Khmelnytsky region during the reporting week, it said. In total, the ministry said, 10 people, including three children, have already died of this disease this year. Since the outbreak of measles, 31 people have died of this disease. "Between December 28, 2018 and March 1, 2019, some 26,544 people fell ill with measles in Ukraine: 11,797 adults and 14,747 children. The highest outbreak rates were in Lviv (4,021 people in total: 1,335 adults and 2,686 children), Vinnytsia (2,339: 1,014 adults and 1,325 children), Rivne (2,299: 808 adults and 1,491 children), Khmelnytsky (2,007: 1,073 adults and 934 children) regions, and the city of Kyiv (2,310 people: 1,293 adults and 1,017 children)," the ministry said.